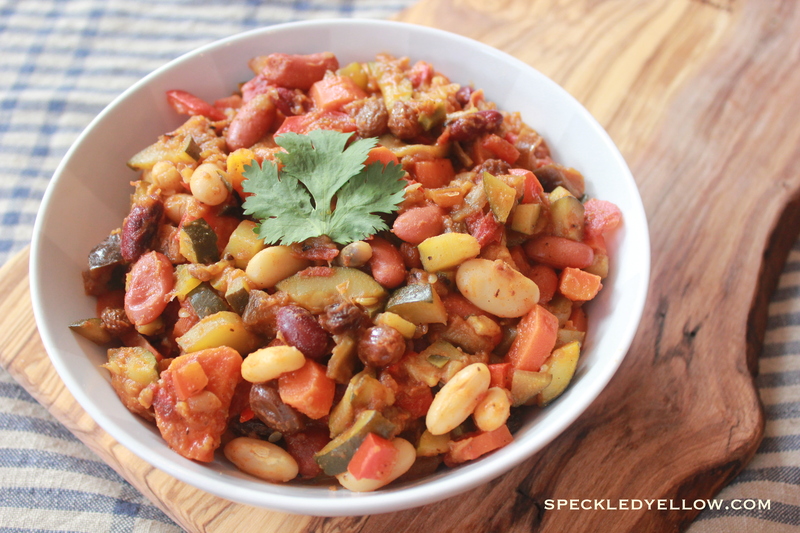 Spice up your night with this veggie packed chili. This has been my go to recipe for those cold wintery days when you just don’t know what else to cook but you are a hungry biatch! I also just made this last night for a dinner party/game night and literally had no left overs. Even all the men ate every last morsel on there dish! 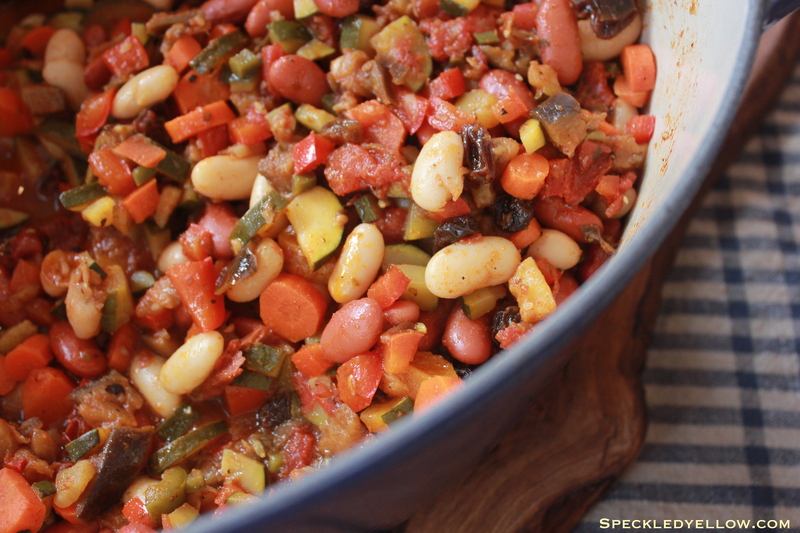 Pair this with my Gluten-Free Dairy-Free Corn Muffins for a scrumptious meal. Top it off with some fresh cilantro and some fresh salt and pepper to taste! 1. Let’s roast up some eggplant. First, put the cubed eggplant in a bowl and toss 2 Tbsp of extra virgin olive oil to coat each piece. Grab a shallow roasting pan and evenly spread the eggplant over the pan. Finally cover with aluminum foil and bake for 30 minutes, stirring once or until lightly browned. 2. In a 5 to 6 qt Dutch oven (I use my large oval Le Crueset and it works wonders!) heat 3 Tbsp of extra virgin olive oil over medium heat. Add the garlic and cook for 1 minute while stirring occasionally. Then add all red bell peppers, jalapeños, zucchini, and carrots and cook for another 5-10 minutes, stirring occasionally. 3. Add the chopped tomatoes to the pot. Then, add the cumin, fennel seeds, oregano, chili powder, and red wine vinegar. Slowly add the eggplant and let simmer for 20 minutes on low heat. 4. Finally, add the lemon zest, lemon juice, beans, sugar and of course raisins and/or dried apricots and let simmer for 8 more minutes. Touch it off with some salt and pepper to taste and cilantro and you are ready to enjoy!